According to a recent report by the CDC, only one in nine Americans who have pre-diabetes are aware of their condition. Why is this important especially to health conscious moms? Because pre-diabetes is just that–a condition which transforms into type II diabetes with time. The likelihood of this condition progressing to diabetes can be significantly decreased through diet and exercise–but you need to know you have it first! Given the epidemic of diabetes that is going on today, anything we can do for ourselves and our children along the lines of prevention is very important. The first step towards prevention is an increased awareness of the signs and symptoms of pre-diabetes. One common sign in women is long and irregular cycles accompanied by dark hair on the upper lip, chin, chest, upper arms–called male pattern hair growth or hirsutism. Other signs could be infertility, adult onset, hormone related acne, and difficulty losing weight. This symptom combo is due to a disease called polycystic ovarian syndrome (PCOS) ninety two percent of the time. Long and irregular cycles are common when women first start having periods, unfortunately, young women are frequently given synthetic hormones to regulate a phenomenon that could resolve itself if given a year. It is extremely rare for the underlying cause of irregular cycles in young women to be diagnosed, and corrected. In the case of irregular cycles due to PCOS, one of the major underlying causes is insulin resistance—aka–prediabetes! So what can be done, if you or your teenage daughter has irregular cycles? If your cycles do not start to “regulate” with these lifestyle changes, you may need help from your doctor. 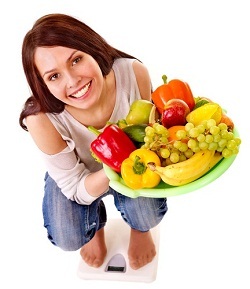 Doctors who are open to complementary and nutritional medicine will offer the most holistic solutions. The bottom line is that irregular cycles are due to an underlying cause with serious long term health effects. Women need to be educated on the connection between irregular periods and prediabetes, so that early intervention with lifestyle changes can prevent the development of diabetes later in life. A little knowledge could go a long way in battling this epidemic! Laurie Heap M.D., founder of the website www.RUhealthyRUhappyMD.com, graduated from the University of Kansas Medical School in 2001. Her passion, in addition to her four kids and wonderful husband, is helping women treat hormone related symptoms by restoring balance to the body, rather than symptom masking and medicine stacking. You are so right on with this post. I gained a ton of weight because of stress and overeating and my cycle stopped for over a year. Now I juice and eat mostly veggies and lean fish and chicken and I lost weight, got energy and my cycle is regular. Thank you for this post! More ladies need to be aware. Thanks for commenting on What Jean Likes. Just getting back to everyone who commented now!! I'm following you via FB and Twitter! Jean – Thank you for stopping by and leaving us a comment. Laurie is our newest contributor here at The Healthy Moms Magazine. She has a ton of very helpful information and tips to share about women's health. Great post! Thanks so much for sharing this info! So many women don't know what they can do for themselves regarding their cycles and health. It's refreshing to see education and awareness in this area.